In October 1991, the Foundation funded the University of California-Berkeley to survey the nature and extent of services for grandparent caregivers in the United States. 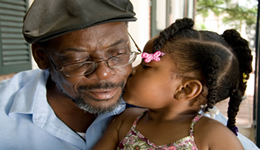 In 1993, we provided support for the establishment of the AARP Grandparent Information Center, which provides resources and information on issues confronted by grandparents who are raising their grandchildren and the professionals who assist them. The Relatives as Parents Program (RAPP) was initiated in 1996. It is designed to encourage and promote the creation or expansion of services for grandparents and other relatives who have taken on the responsibility of surrogate parenting due to the absence of the parents. Currently RAPP provides extensive services, primarily to relative caregivers caring for children outside the foster care system. As part of our sponsorship of RAPP, we conduct our National Orientation and Training Conference to facilitate opportunities for training, networking and information exchange and provide technical assistance to our RAPP Network through our listservs, site bulletins, conference calls, web chats and our annual newsletter.